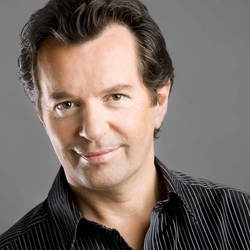 Finbar Wright, tenor, songwriter, and poet, was born in Kinsale, Co.Cork, Ireland. Growing up on a farm, his musical education began at the age of six when he received instruction on the piano from the dedicated and well-loved teacher, Maura Hourihane. He later studied theory of music with George Dunne at one of the oldest schools of music in the world, The Cork School of Music, where he also studied singing with Robert Beare, and piano with distinguished Spanish pianist Angel Climent, who was to be his accompanist for many years. On his path to becoming a professional singer, Finbar studied with such renowned performers as Ernst Haefligger, the beautiful & accomplished Romanian soprano, Ileana Cotrubas, and, finally, with Ireland’s legendary Veronica Dunne. Having won all of the major singing awards at Feis Ceoil, Dublin and having represented Ireland at the BBC’s Cardiff ‘Singer of the World’ competition, he began his solo career in 1990 with the release of his first best-selling album ‘Because’ ,(produced by Phil Coulter), on the Sony label. Since then he has recorded six solo albums, one of which, ‘Whatever You Believe’, (produced & conducted by the renowned Mike Batt), was a Christmas Number 1 in 1992, selling more than 100.000 units in the island of Ireland alone. He has also recorded six albums with the world famous ‘Irish Tenors’ who have enjoyed phenomenal success all around the world, dominating the American Charts for the past five years. He presented a hugely successful television series with actress Angeline Ball on RTE in the 1990’s: ‘Music of the Night’. He has also recorded numerous television specials, including one for UTV ‘Live from the Belfast Opera House’, which has been regularly broadcast in the USA & Canada. In 2006, as part of The Irish Tenors he recorded a ten-part series for RTE television which has been broadcast with great acclaim and includes, among its guests, the renowned composer Andrew Lloyd Webber. He has performed at many historical world events in recent times, including the reading of the Gospel at Pope John Paul II’s legendary first Papal Mass at the Phoenix Park, Dublin, in 1979; the impressive State Dinner given in honour of U.S. President Bill Clinton at Dublin Castle in 1995; and he performed live for ‘Good Morning America’ during its coverage of President Reagan’s funeral on Capitol Hill, Washington in 2004. Some of the more unusual undertakings in his career include recording an official anthem for the Arsenal soccer club in 1998, together with player Ian Wright. He has appeared in concert with such music legends as Monserrat Caballé, Dame Kiri Te Kanawa and rock & roll legend Jerry Lee Lewis. He has won several of the major awards of the Irish Music Industry, including ‘Best Artist of the Year’ in two consecutive years in the mid 90’s.